Haunted by the car accident that ended her career as a cookbook publicist, Val Deniston has traded in the chaos of New York City for a quieter life near the Chesapeake Bay. Living with her curmudgeonly grandfather in the tourist town of Bayport is hardly glamorous, but she enjoys working at the Cool Down Cafe at the local fitness club, and she finally has time to work on her long-planned cookbook. 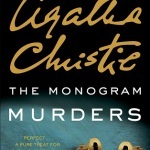 But when one of the club's patrons is found dead, she'll have to cook up a scheme to find the killer. As the number of suspects rises like crabs in a bucket, it's out of the pan and into the fire for Val. If she can't find the culprit soon, she might as well be chum in the water. While culinary mysteries have become popular only in the last few decades, the combination of cooking and killing has a much longer history. The last thing that many a Roman emperor, a Borgia rival, and a bullying husband did on this earth was eat a nice meal. A key ingredient in today’s culinary mysteries, probably missing from poisonings throughout history, is a large helping of humor, starting with the food-pun titles that most culinary mysteries have. I acquired an appetite for creating a culinary mystery series when I wrote “Delicious Death,” a story that appeared in the 2010 anthology, Chesapeake Crimes: They Had It Comin’. Cooking, eating, and conversation about food are the critical elements in the story, which begins and ends with a dinner party. The solution to a sudden death turns on answering a food question: Who knew what was in the appetizer and when did they know it? 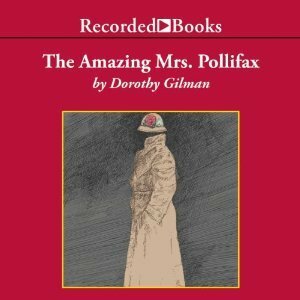 The characters in the story display different attitudes toward eating: a glutton, a food snob, a “cook” who nukes every meal, and a hostess whose dishes are works of art. Those attitudes are clues to the mystery’s solution. You can read the story on my website. I had a lot of fun writing “Delicious Death” and found my niche. 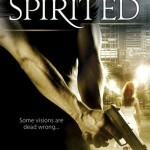 In 2012 I heard through Sisters in Crime about an agent willing to represent a cozy mystery series based on a proposal. I had finished two mysteries by then and decided to turn one of them into the first book in a cozy series. The decision to write a culinary mystery came naturally, not just because I enjoyed writing “Delicious Death,” but also because food plays a role in whatever I write even if the subject isn’t culinary. Rather than describe a room as having a yellow and red color scheme, I’ll say it has a banana-and-raspberry décor. To decide on an angle for a culinary mystery series, I analyzed popular culinary series. Some had cooking professionals as sleuths—chefs, caterers, bakers. I was none of those things, nor did I have experience as a food writer, restaurant worker, or seller of ingredients or cooking tools. Like most people, I’m a home cook with recipes that have become favorites over the years. By Cook or by Crook, in keeping with the tradition of culinary mysteries, includes recipes for the dishes the sleuth makes while solving crimes. Decades ago, as a Mom with two jobs and two preschoolers, I began collecting easy recipes and simplified other recipes that had many ingredients so that I could cook fast. After the kids were older, I had the time to make more elaborate meals, but I rarely found multi-step recipes with dozens of ingredients worth the time and effort. My husband, who always cleans up after dinner, much prefers simpler recipes because the cleanup is faster. He grouses if I use a lot of mixing bowls or pots. My large collection of recipes with few ingredients gave me the theme for my series, the Five-Ingredient Mysteries. The five ingredients relate, not just to the recipes, but also the plot. In many whodunits, five is the number of suspects that remain when the detective summons everyone to expose the culprit. It’s a good number because, with five suspects, the writer can explore a variety of motives without overwhelming the reader. And the books have a minimum of five clues for armchair detectives to decipher. That’s the origin of the Five-Ingredient Mysteries, which I hope you enjoy reading. 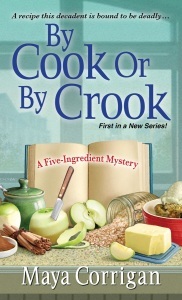 Maya Corrigan serves up a tasty blend of mystery, small-town charm, and a hint of romance in By Cook or By Crook. I really enjoyed getting to know Val Denniston, her lovably curmudgeonly grandfather, and the Eastern Maryland town of Bayport. Val makes an excellent heroine for a cozy mystery: she has reasons beyond her curiosity for trying to find the truth, and she’s smart enough not to put herself in dangerous situations. (Not that they don’t occur, but it’s not through her own lack of caution.) She’s caring and loyal, and while she has a slight tendency toward snap judgements and leaping to conclusions, she’s willing to keep an open mind. Potential love interest Gunnar spices things up a little, and the secondary characters exhibit a realistic mix of good and bad qualities without veering into caricature or eccentricity. Maya Corrigan lives near Washington, D.C., within easy driving distance of Maryland’s Eastern Shore, the setting for her series. She has taught courses in writing, detective fiction, and American literature at Georgetown University and NOVA community college. In 2013 she won the Daphne du Maurier Award for Excellence in Unpublished Mystery/Suspense. Her short stories, written under the name of Mary Ann Corrigan, have been published in anthologies, including the Chesapeake Crimes series. When not reading and writing, she enjoys theater, tennis, trivia, cooking, and crosswords. Her website features trivia about mysteries: mayacorrigan.com. Great Post and love your new look!! 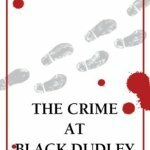 Great write up and review for this book. I would love to get the chance to read it! Cozy mysteries involving food are my favorite! I think writing a series with 5 ingredients in the recipes is ingenious. Congratulations on your work. The recipes look good, too! Nice post, Maya. Your book and your protag sound interesting. They are – I hope you get a chance to read them! I enjoyed it – I think you would, too! I think you’ll really enjoy them, Mary! And thanks for following The Bookwyrm’s Hoard! I’m working on a foodie mystery as well and am so happy to have found you through a SinC post. I would love to read your series and to talk to you as well. Good luck with NaNo, Di! I love a series that combines mysteries with food so the premise of this one is definitely right up my alley! Really looking forward to reading this! What a fun guest post, and I am definitely in favor of simple recipes! Maya, you are a new author to me. Sounds awesome! Can’t wait to start reading! I hope you enjoy it – it’s a fun book! Congratulations on the new release! It sounds great! thanks for this great feature, wonderful post and great giveaway. best wishes. I love finding new series to try. Great article–makes me so eager to read this! You should definitely check it out if you’re a cozy fan!